With the NFL season rolling along, injuries have begun to pile up. Each week, more and more players land on injured reserve, while others battle weekly on the active roster. However, on a positive note, injuries many times lead to refreshed players upon return. Here is everything to know going into Week 6 on the injury front. Missing the last two games with a hamstring injury, Randall Cobb failed to practice at all last week. The Packers ruled Cobb out on Friday, way ahead of Sunday's game. Cobb's absence indicates that his hamstring still has a ways to go. The receiver should be considered week-to-week at this moment. On the same team, Geronimo Allison popped up with a hamstring injury mid-week but ultimately missed Week 5 due to a concussion suffered in Week 4. The concussion remains the more serious issue, but Allison's inability to practice suggests he still has hurdles to clear in the protocol. Allison should be considered questionable until he can return to the practice field. After Leonard Fournette suffered a hamstring in Week 1, the stud running back attempted a Week 4 come back only to aggravate the injury. Fournette subsequently missed Week 5 and looks likely to miss this upcoming week according to Ian Rapoport. The journalist noted that Fournette's hamstring is back to where it was a couple weeks ago. Based on this comment, Fournette remains week-to-week. T.Y. 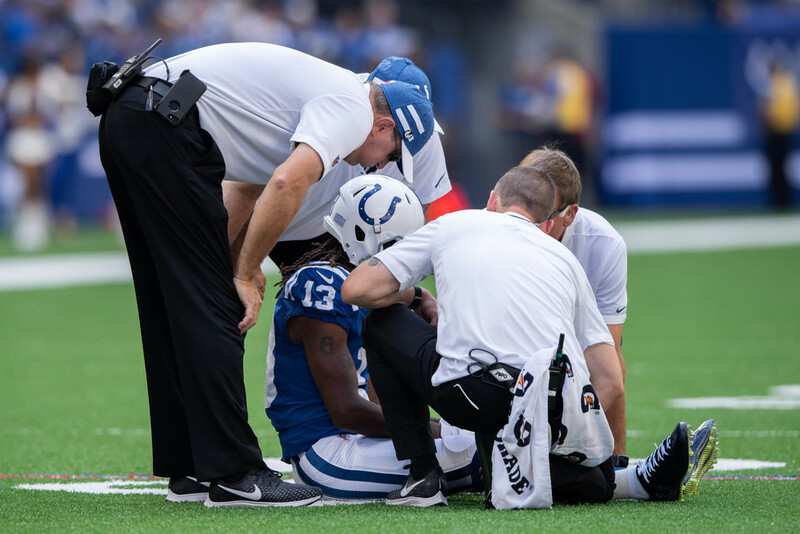 Hilton initially left the Colt's Week 4 game in the 4th quarter with a hamstring injury and then missed their following Thursday night game. Hilton's status has not been updated since last week, but the receiver failed to practice at all. Until Hilton returns to the practice field, he should be considered questionable for Week 6. Both Cooper Kupp and Brandin Cooks left Week 5 with concussions and failed to return. The receivers entered concussion protocol and must pass multiple stages in order to play this week. Coach Sean McVay said he is hopeful the two can pass protocol and play this Sunday, but concussions need to be monitored throughout the week. After injuring his hamstring in Week 3, the Vikings rushed Dalvin Cook back in Week 4. Cook subsequently aggravated the problem and missed Week 5. Cook failed to practice at all last week and looks on the wrong side of questionable coming into Week 6. Seemingly landing a new injury every week, Matt Breida sprained his ankle in the first quarter of San Francisco's loss. The sprain is reportedly a mid-ankle sprain, suggesting Breida may not miss many games. However, he remains unlikely to suit up for Monday night football against the Packers. Alfred Morris will step in as the primary ball carrier in his absence. Dealing with a chest injury, Lamar Miller suited up for Sunday Night Football, but played zero snaps. Miller's role as the emergency back suggests he was close to playing in Week 5. After the game coach, Bill O'Brien said Miller would be back for Week 6. Barring a setback, the Texans feature runner will suit up next week. Re-breaking his surgically repaired foot in Week 1, Greg Olsen will reportedly attempt to make his return in Week 6. Olsen began to practice on a limited basis last week, but still has another check up before he can play again. Speaking on Monday, Olsen said himself that he expects to have surgery in the offseason to repair the damage to his foot. Olsen's health is truly up in the air and if he returns he could be at risk of aggravation. Already dealing with a fracture in his back coming into the week, Jay Ajayi tore his ACL on Sunday. Curiously, Ajayi returned to the game after the knee injury. This ends his season, but Ajayi should return ready for the start of 2019.